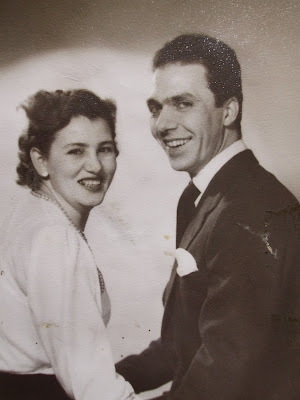 My late parents were married on this day sixty years ago. They were 27 and 26 and had met a couple of years earlier in the various places and circles in central London where young Italian migrants met and socialised. It wasn't entirely love at first sight (my mum liked the look of him but my dad was going out with someone else! ), but once they got together there was no looking back for either of them. As my father lived in Westminster Cathedral parish they were married there, in the Lady Chapel. The venue was the grandest part of their wedding, which was extremely modest and quiet. My parents were romantic but also pragmatic: they briefly discussed having a large "dream" wedding, but instead decided to put their modest savings and any family contributions towards eventually buying their own home. Yes, my mother splashed out on a new dress, but it was a calf-length pearl-coloured one she could wear again to formal occasions. Trans-continental travel was still expensive, so only my grandparents came over from Italy; the other guests were some relatives of my dad already living in London and a few close friends. There was a best man but no bridesmaids, the wedding lunch was in an Italian restaurant run by a friend, and in the evening some of them went to see a show. What you need to make a happy, long-lasting marriage is something they had in abundance: a strong, generous love for each other which kept them together for better, for worse, for richer, for poorer, in sickness and in health... Yes, things weren't perfect: I can remember rows, slammed doors and raised voices, tears, worries and dramas; but I also remember kisses and little jokes, anniversary romance and - especially in their later years - constant loving concern and selfless support. They had made their vows until death us do part, and the parting didn't last for long. After my mother died my father languished and then died, broken-hearted, only three months later. During the final year they shared on earth, as infirmity took an increasingly stronger hold on both of them, they would often sit together holding hands. Fifty-two years after their wedding, in what little time they had left together, they seemed to be rediscovering the depths and intensity of the love of their youth. It was a sweet, poignant, romantic sight to behold. Hand in hand they sat, physically, just as hand in hand they had travelled, metaphorically, throughout their life together. And I'm sure they're sitting hand in hand today, in some corner of heaven, quietly enjoying each other's company and celebrating their diamond wedding anniversary and their strong, enduring love for each other. Thank you. This reminded me of my own parents, who were married for 56 years before my dad died. They were always very loving and affectionate, especially in their old age and hardly ever apart. A wonderful example to their children!